The end of the Cold War and the collapse of the Soviet bloc had a profound impact on the international conventional arms trade. The nature of global demand altered, moving from rivalry between the two superpowers to new regional security issues. 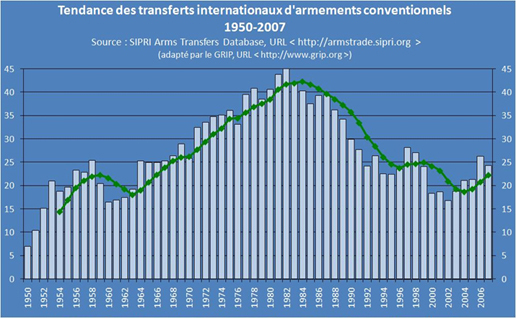 Although these changes led to a big drop in global arms sales (in 2007, they were at barely half the 1982 level), many countries, particularly in the developing world, have continued to buy large quantities of new weapons. Instruments adopted over the past twenty years (strengthening national legislation, the United Nations 1992 Arms Register, the 1993 Wassenaar Arrangement, the European Union 1998 Code of Conduct, etc.) have made considerable progress in controlling arms exports. GRIP’s work is a determined part of this dynamic to constantly reinforce the control of and restrictions on the arms trade. Art Exhibition "Crush the Illicit Trade in Small Arms"
An art exhibition, by Almaparlantes, a musical group from Colombia, entitled "Crush the Illicit Trade in Small Arms" opened at UN Headquarters in New York. 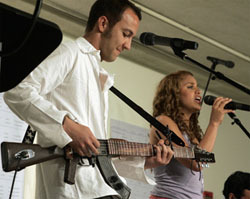 The musician (left) is playing an "escopetarra," a guitar made from an AK-47. Note : l'histograme représente les totaux annuels, en milliards USD, aux prix de 1990. La courbe représente un indicateur de tendance basé sur des moyennes mobiles de cinq ans ; La moyenne est pointée à l'année correspondant à la dernière année de la période de cinq ans (exemple : l'abcisse 1980 correspond à la moyenne de la période 1976-1980, l'abcisse 2007 correspond à la moyenne 2003-2007, etc. ).